Located some 100 miles south of Tampa, the city of Punta Gorda is well known as an ecological and boater’s paradise, offering all the best of Florida’s famous tropical outdoor lifestyle. Bordering on the southern bank of the beautiful Peace River and eastern shore of the expansive Charlotte Harbor leading out to numerous barrier islands and the Gulf of Mexico, the area offers a multitude of diverse sport and leisure activities, especially watersports, eco-tourism, and golf. It is a truly outstanding place to live, and an even better place to retire in. Compact in size — only 18,600 people live within the city limits — just across the bridge to the north is Port Charlotte with some 61,700 residents, and several other smaller urban areas. The overall metropolitan area population tops 169,650. Annual growth for the metro area is 2.33 percent, with a median age of 57.7 and median household income of $44,865. The annual median household income for Punta Gorda residents is actually higher at $51,278. Although a sizable percentage of the residents are retired, the projected future job growth for the area over the next 10 years is 38.5 percent, higher even than the U.S. average. All these indicators point to the area having great business potential, especially for service industries such as car washes. 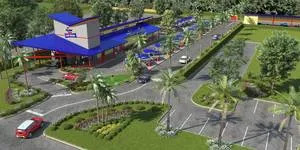 Seeing the potential of this beautiful and steadily growing area, and the lack of any existing major car wash facilities, entrepreneur and car wash operator Max Levine decided that Punta Gorda was an excellent place to open a new location. He already owned another wash location some 25 miles to the south in the city of Fort Myers, which he had purchased and renovated back in 2015. 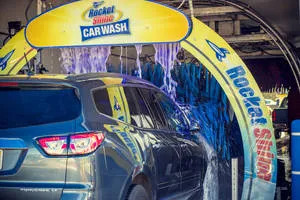 Rebranding it Rocket Shine Car Wash, his leadership skills and direction brought the struggling facility back to life, finding success by providing his customers with quality washes, excellent service, and good value. Car Wash Association and the International Carwash Association cemented his decision. Levine’s design objectives for his new wash location were, first and foremost, a site layout that made for a safe, convenient, and highly positive experience for both his customers and staff; second, to install a longer wash tunnel to help maximize throughput and equipment and chemical effectiveness in the wash process; and finally, to create excellent curb appeal with a striking architectural design that matches the rocket-themed branding with clean, bold colors and modern design elements. 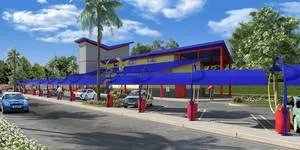 To achieve this, Max decided early in the project development process to hire Car-Wash-Architect.com to do the design. 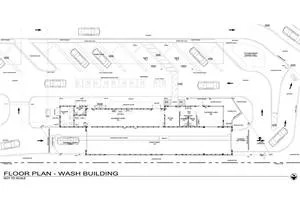 With the project architect on board, along with an excellent local civil engineer, a highly experienced equipment supplier, and a very knowledgeable project construction manager, the design development team for the new Rocket Shine Car Wash location was complete and ready to proceed with the owner’s vision. The team quickly pulled together, coming up with solutions to all of the design challenges and city requirements, and were able to deliver an excellent design in a timely manner. An abbreviated review of the project development process will be covered step-by-step in the sections that follow. 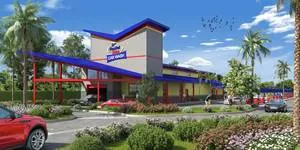 Finding the correct site for the new car wash location was critical to the overall success of the project. The owner wanted one centrally located in the city along a major access road, and one large enough in size to achieve his design and business objectives. The site finally selected for the new wash location was a vacant piece of land near the city center on US 41 (aka Tamami Trail), Punta Gorda’s main thoroughfare. Located in the city’s main business district and surrounded by existing businesses, restaurants, and government buildings, the property was purchased by the owner in late 2017. Orientated west-to-east, the property abuts the city’s police department and main fire station adjacent to the north, an existing two-story motel to the south, and railroad tracks and a mini-storage facility to the rear. The four-lane highway is on the west side. Basically L-shaped in appearance, the site is approximately 412 feet long by 124 feet wide at the main rectangular part with a 188-foot long by 85-foot wide ‘tail’ attached perpendicularly at the far end in the rear. Overall site area is exactly 1.50 acres. Although not possessing very much frontage along the street, the site was nearly perfect in shape and size to lay out a major car wash facility with a long tunnel, lots of full-service and free-vacuum spaces, and great stacking. All of these items could be placed in the main elongated rectangular part of the site. The tail part of the property lent itself perfectly to installing a large detailing center, along with plenty of employee parking and sufficient area to allow a large rain-water-retention area for the site (this considerably lowers building costs compared to placing it underground). Building setbacks and landscape buffer requirements were minimal on all sides, allowing us to really maximize the selected site to its full potential. One interesting item to note is that the city actually had a code requirement that the front edge of the building facing the street had to be within 25 feet of the property line. This gave us an opportunity to move the building considerably farther forward than we normally would have and to provide even greater stacking. The only flaw in the overall design was our inability to fit in three stacking/pay lanes due to limitations in property width. If the property had been just a little wider, we could have achieved this as well. Tunnel entrance on the right. In the final completed site design we were able to provide a highly functional layout with superior, highly controlled traffic flow, great stacking, a large number of vacuum and parking spaces, and excellent ingress/egress to the site. The site as laid out includes a total of 13 large free-vacuum spaces, six full-service spaces, and two handicap spaces (also utilized as full-service spaces). All parking spaces were installed at a comfortable 45 degree angle on a one-way driveway, accessible only through the tunnel exit, thus limiting the free-vacuum spaces to only paying customers. The separate detailing center building can comfortably handle up to six vehicles at a time under the roof, and a total of 10 employee parking spaces were provided as well. One interesting feature that the owner had us include in the site design was a small putting green for customers to use while they wait for their cars to be ready. This should make customers happy since Florida is packed with golfing enthusiasts. The monument sign at the Fort Myers location. architectural design components. We wanted the design to reflect the name and logo of the wash, namely a “Rocket,” and so incorporated “Googie” architecture elements, a futuristic space-age style that was very popular in the ‘50s and ‘60s. Many buildings such as motels, diners, gas stations, and numerous car washes built during that period utilized this style, especially those in Southern California. The style featured long gently sloped colorful roofs, striking geometric shapes, lots of steel columns, beams, and siding, bright colors and often an eclectic mix of building materials. Wanting a major architectural design element to draw interest from passersby on the street, we incorporated a very large tower feature at the front of the building. After testing out several different designs, we decided that the best look for the tower was a “Delta” shape orientated towards the street. This shape seemed the most appropriate to the Rocket Shine theme and worked perfectly with the logo. For the main part of the wash building we used simple opposing colorful metal shed roofs with large clearstory windows to bring in light into the tunnel, and large exhaust vents to help get the excessive Florida heat out. Metal roofs are very cost effective, long lasting, and can be painted bright colors to attract attention. We extended these angled metal roofs out on each end to create covered porches for both vehicles entering into and exiting the tunnel, and for a customer waiting patio and covered walkways. With the very large windows installed in the customer lobby, these extended roofs knocked down any direct sunlight and heat entering into the building. Creating a highly functional floor layout for the building with no wasted space anywhere was paramount in the design. After much pushing and pulling, the final design has well balanced rooms with no dimension too tight or too big, but still adequate in size to allow some equipment to be added. 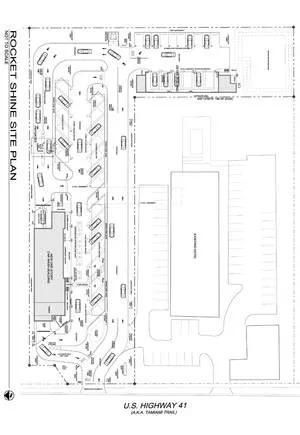 The plan features a 135’-4” long conveyor (112’ enclosed) with a 20’ wide wash tunnel and large loading porch; a 60’ x 12’-8” wide equipment room; 9’-4” x 8’ towel cleaning area; and a large enclosed central vacuum unit room. An employee restroom is also conveniently located here. In the front of the building the A/C areas are efficiently grouped together with a large customer lobby with a unique large corner window feature to open the room up to the outside, and a large window for customers to see all of the action in the wash tunnel. Adjoining it are two customer restrooms and a large manager’s office. Tunnel action at the Fort Myers location. 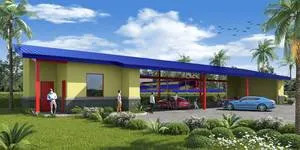 The building structure primarily utilizes concrete block construction, both inside and out, with poured beams and columns in order to meet Florida’s rigid hurricane design requirements, as well as to make the structure “car wash” proof. There also are many steel beams and columns featured at the exterior porches and covered walkways, and in the large tower structure. Exterior finishes include split-face block facing at the base, painted smooth-finished stucco on the main part of the walls, and decorative metal panels over the tower and upper walls. The roof material is painted metal R-panels over built-up roofing and plywood sheathing, all attached to metal ZEE roof purlins set at a 3:12 pitch. Utilizing the same building materials, design elements, and finishes as the wash building, the detail center has a very efficient and functional layout made for high capacity. Able to handle up to six vehicles at a time in a very large covered detailing bay, the area is open on both sides with a sloped metal roof allowing plenty of air movement to keep employees cool and comfortable, allowing them to work more efficiently in the hot Florida weather. At each end of this long building are enclosed areas — one with an employee breakroom and owner’s office and restroom, and the other side with a vacuum room and a large storage room for detailing chemicals and equipment. For this new location, Levine decided to go with MacNeil Wash Systems of Canada for the wash equipment. He selected this company due to its overall quality and engineering excellence, along with his positive experience utilizing it for the last three years at his Fort Myers location. Installing a longer conveyor allowed the tunnel to be packed with wash equipment, but still have plenty of drip space. This was a major design issue for the owner right from the start, as he explains, “Size gives us flexibility for the future, and it also gives our chemicals the time they need to work optimally. I’ve seen great results in other markets where tunnels had relatively little friction equipment, but a lot of dwell time and drip space. So I think we can get the best of both worlds in a larger tunnel.” The equipment room installed is also very spacious, making working on the wash support equipment easy, while allowing room for future expansion. For the three central vacuum systems, Levine chose Vacutech as the supplier. Instead of utilizing vacuum arches, he decided to have three fabricated metal shelters installed with individual vacuum drops. The detail center building also has numerous vacuum drops installed to increase efficiency for employees. At the pay gate area, there are two POS units installed to process customers. The system selected was the Auto Sentry Flex by Innovative Control Systems (ICS). The two POS units will be protected from the elements by a uniquely designed cantilevered metal shelter. The last major pieces of equipment to be installed are four Rhino-Mat floor-mat cleaning machines, with two units located next to each building. This new Rocket Shine location in Punta Gorda is currently under construction and projected to open sometime in late spring of next year. The local city government is quite excited about this new business opening up and has been very supportive throughout the entire planning and construction phases of the project. The general public is also eagerly anticipating the wash opening. 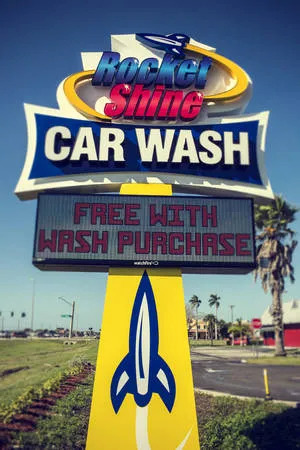 Being the largest and most elaborate car wash facility to ever be built in the entire Punta Gorda metropolitanarea, Rocket Shine Car Wash is sure to be a big hit with local residents for many years to come.